It had to happen. It was as inevitable as night follows day. The 1996 presidential election has been Web-ized. This is a first in a century that has seen quite a few firsts in presidential campaigning. Roosevelt was the first to use radio successfully in his campaign, Kennedy was the first to use television successfully in his campaign, now both Clinton and Dole (and a host of other candidates) try to harness the Web. But this time it's different. This time it's digital. Both Republicans and Democrats have invested heavily in the development of their campaign Websites this year. Both sites seem to be professionally done. From a technological point of view, I'd give a very slight edge to the Dole site because it isn't as rude to non-Netscape compatible browsers as the Clinton site is - it at least pays lip service to the Internet Engineering Task Force (www.ietf.org) HTML standards. I'll show you what I mean with a few screen shots. 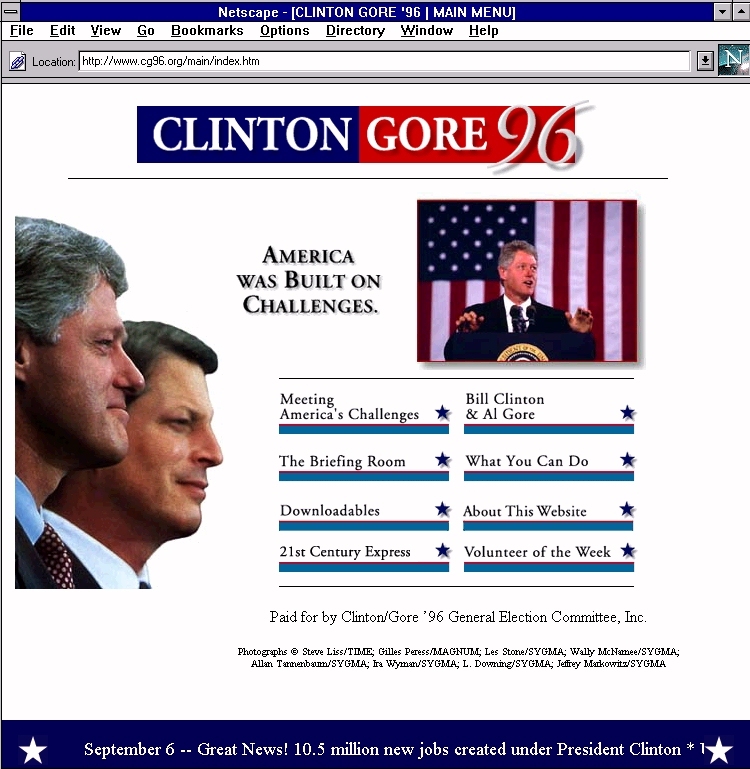 Figure 1 is the Clinton/Gore main page (www.cg96.com/main/) as rendered by Netscape 3.0. Figure 2 is the same page as rendered by the current version of NCSA's Mosaic. The differences are a product of the fact that the homepage is specifically designed for one browser - Netscape. The Netscape HTML extensions used are not universally supported because they are not part of the standards adopted by the IETF. In fact, such HTML extensions as tables, Java applets and scripts, and text flow around images, long staples of Netscape, have yet to be codified by the World Wide Web Consortium (www.w3.org) - chronologically the precursor to IETF consideration. IETF adoption, if it comes at all, is a long way off. Java presents some other problems for the typical surfer armed with a vanilla browser. Note the photo of President Clinton at the lectern on the right side of Figure 1. That is an image frame created by a java applet which renews every few seconds. We note that it's stuck on the first frame in Figure 2. The slide show becomes, in fact, one slide. I would think that writing campaign homepages which will run on only one company's product is not the wisest of political strategies. But more than that, the attachment to Netscape extensions disadvantages two important groups - that part of the general population which does not have direct Internet access and relies on their service provider for client-side software, and those who shy away from Netscape 3.0 and Java for security reasons. The first group comes from the middle class - the bread-and-butter of American politics. The second, much smaller group includes that part of the intelligentsia which is concerned with computer security. Combined, we're dealing with millions of people. Developing advertising media which excludes these folks seems like against-the-grain reasoning for pragmatic politicians to me. Interestingly enough, the Whitehouse homepage (www.whitehouse.gov) has a history of similar deficiencies. It has only been in the last few months that they finally supported Windows-compatible WAV audio files - which is native for about 75% of Web clients. Figure 1. 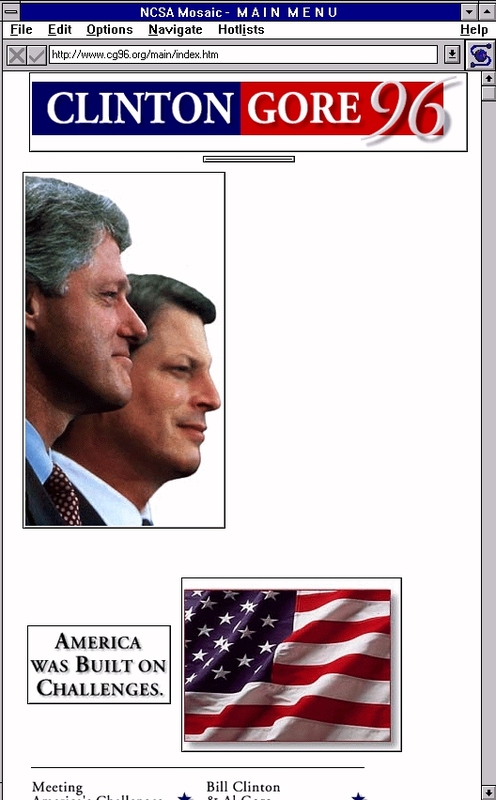 The Clinton/Gore splash page as rendered by Netscape 3.0. Everything is aligned nicely. A slide show appears in the window (technically a table) on the right which rotates through a half-dozen images or so every few seconds. Figure 2. The Clinton/Gore splash page as rendered by an IETF-compliant browser - in this case NCSA's Mosaic. Note the mis-alignment. The slide show is 'stuck' in the first frame as well because the browser doesn't support Java applets. The Dole homepage (www.dole96.com/main/) is the more conservative of the two - both in terms of message and technology. There are also animations on the Dole page - the steam rising from the coffee cup at mid page and the Dole/Kemp Website address at the bottom of the page - but they are animated GIF images, not Java applets, which are more widely rendered and present no security threat. From a technological point of view, the Dole homepage is "kindler and gentler" on the browser. Figure 3. 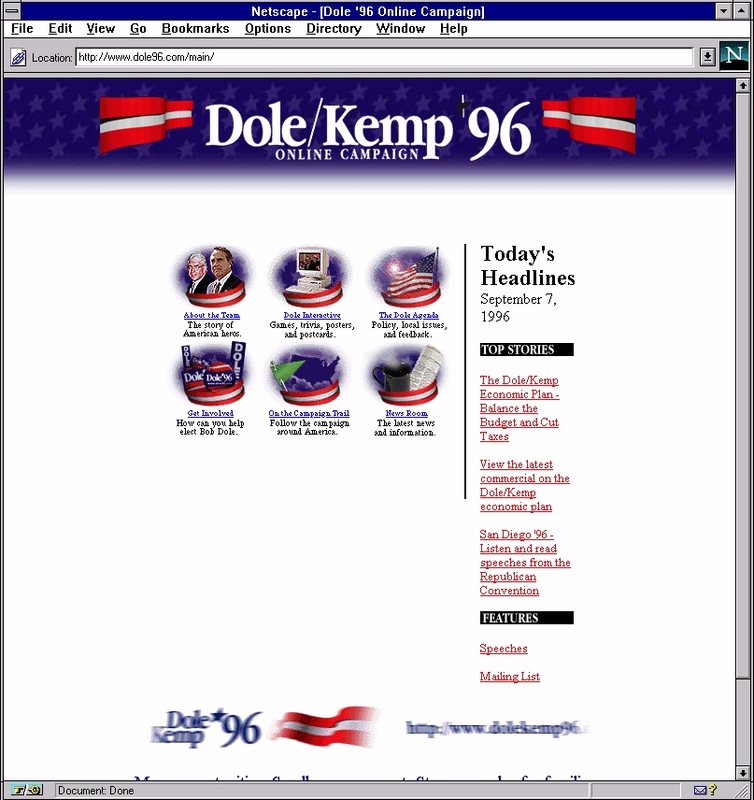 The 'kindler and gentler' Dole/Kemp main page. This use of Netscape extensions causes fewer rendering problems for non-Netscape browsers. Note: this screen shot intentionally captured one of the stages of animation where the Dole message at the bottom is slightly out of focus to give some feeling for how the animation proceeds. I have mixed feelings about the current zeal with which modern politicians approach cyberspace. Despite all of the hoopla from Gingrich on the one hand, and Clinton/Gore on the other, not much has happened in American politics to instill much confidence. The "wired" Congress which Gingrich promised in 1994 never got much beyond the ribbon-cutting ceremony. As columnist Brock Meeks points out, the online Congressional system is "even less efficient now than when it was rolled out... Congress has become increasingly hostile to all things cyberspace." The current use of the Web for the present presidential campaign should be understood in this context. As food for thought, I offer Berghel's first law of political cyberspace: political campaign offices will connect to the Web long before the Congressional offices get e-mail. The political use of cyberspace is a mixed bag. If it produces a better-informed electorate and a more participatory democracy, it will have had a positive social effect. If it is used to narrow-cast tailor-maid, spin-doctored propaganda to important voting groups, and cater to special interests, it will not have had positive social effect. At this point, it's too early to tell which will result. For the moment, the political use of cyberspace is fairly innocuous. The campaign Websites seem to be tastefully laid out and purposeful, to the credit of the Web public relations folks involved. That, in itself, is a step forward. Last year at this time the sites were in much worse shape. I recall being brought in as a consultant for one of the primary campaigns to see a tacky blue bumper sticker above a tasteful black-and-white photo of the candidate, with a list of press releases organized by date, not content. When asked to comment, my first reaction was "words just aren't adequate." If there is a weakness in the current Web campaign it's that the use of Web technology seems to be more oriented toward the glitz than substance. Perhaps this will change as the politicians and their public relations firms mature with respect to their understanding of cyberspace. In the end, I suspect that the current Web campaign won't matter much. I suspect that fewer surfers will be reached by these Web pagest than will have been reached by national tv spots. Such being the case, we'll have at least four more years to think about the Web-izing of political campaigns.